Grimas Cake Make-Up is a very matt basic make-up. It is used for cosmetic make-up (television, film and photography) as well as for large and small-scale theatre. Cake make-up is ideal for large areas of the body (e.g. for ballet, body-painting or facepainting. Cake make-up is available only in 35-grams. 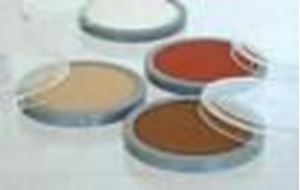 There is a large range of colours of cake make-up: black, white, off-white, grey and a wide range of skin shades, from light to very dark skin. the skin should be clean. You could use Grimas Cleansing Lotion. If the skin is somewhat dehydrated or sensitive, you can apply a thin layer of Grimas Under Make-Up Base once you have cleansed the skin. Do this a few minutes before applying the cake make-up to ensure that the under make-up base has been completely absorbed into the skin. Do not use any greasy creams under the cake make-up. Key to colour chart: B1 - beige 1; B2 - beige 2; B3 - beige 3; B4 - beige 4; B5 - beige 5; B6 - beige 6; D8 - for dark skin; D12 for dark skin; GO - Neutral light; G1 - Neutral women - G3 - Neutral men; G4; J3; J5; LE - Light eqyptian; DE - Dark egyptian; OA - Old age; PF - Pale flesh - N2 - Dark brown; N3 - Warm dark brown; 001 - White; 003 - Broken white; 101 - Black; 102 - Light grey; 1001 - dark brown; 1002 - Stage women; 1002 - Stage women; 1004 - Chinese; 1005 - Stage women; 1006 - Middle aged woman; 1007 - Old age; 1014 - Dark brown men; 1015 - Light brown women; 1027 - Stage men; 1033 - Stage women; 1040 - Gypsy, light brown; 1043 - Chocolate; 1075 - Brick red; 1124 - Stage colours increasing; 1125; 1126; 1521 - Corpse colour. Grimas Blood Tube - 8ml Handy to carry about when on a film shoot or cas sim exercise.